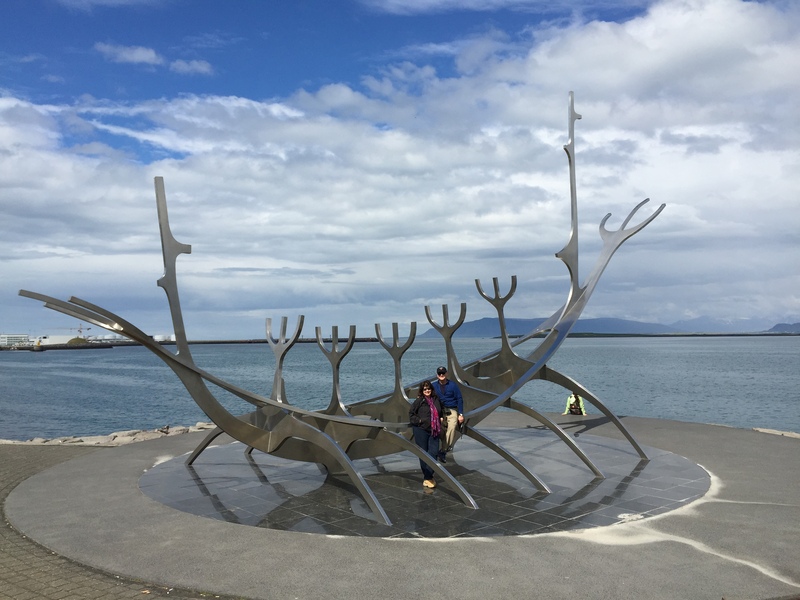 Today was spent in the capital city of Iceland, Reykjavik. The shoreline path from Laugarnes Peninsula continued all the way to town and was a scenic, easy 30 minute walk from home and had interesting sculptures dotting the trail, most notably the Sun Voyager by artist Jón Gunnar Árnason. Iceland is splitting down the middle. At a rate of about 2 cm per year, the Eurasian and North American tectonic plates are pulling apart from each other right in the middle of a lake in Thingvellir. Of course, it’s turned into the perfect spot for divers and snorkelers to experience geology in a whole new way–by swimming in between the tectonic plates in some of the clearest water on the planet. As we geared up in our drysuits near the entry ladder in the Silfra Fissure, our Dive.IS guide described the area surrounding us and motioned to the incredibly clear water below. It was after 7 p.m. when we made our first descent, but the sky was no darker than this morning’s trip into town. The 2 degree celsuis water felt like icy needles against my face as we submerged beneath the surface. The jagged tectonic walls formed a skinny path that we slowly followed, hanging out just below 30 ft. for most of the fissure. As the walls widened into a shallow room, we frog-kicked at the surface to avoid disturbing the silty floor. It was my first time in a drysuit, but I found it easy to learn, and after a few careful minutes, my swim was relaxing and easy. By the time we reached the second ladder, my lips were completely numb. We warmed up with some hot cocoa back at the van. It only took a few minutes and I was ready to jump back in for another 25 minute dive. The second dive was slightly more stirred up than the first (a group of snorkelers had gone through) but I was still just as awestruck by the underwater topography and brilliant greens and blues throughout the fissure. This is amazing! Glad to have stumbled across your wonderful travels!